Every year, we get our tree from a local tree farm. Little bugs gets to pick it, dad does the cutting, and I take pictures. This time around, it was cold and grey, still the mood was great. This is the tree that got picked. Even though little bug is getting older, we still opted for a kid friendly Christmas tree this year. Most of the ornaments are soft toys and the ones I made along with some paper and plastic ones. I dubbed it the Santa workshop tree because of al the sweet teddy bears and other stuffed animals we found. Of course there are a few keepsake ornaments gathered over the years. Hey Caroline! Im your newest follower! You are my "Neighbor" over at Thrifty Linky party! Your tree is BEAUTIFUL!!! It is BIG and LUSH ans I can smell it from here! I LOOOOVE the ornaments..such a warm, heartfelt tree! 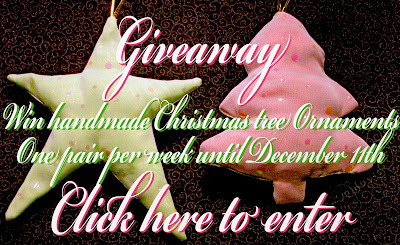 I would LOVE it if you would visit my blog and 14 days of xmas trees...I have a giveaway that would match your decor! Off to look at more of your blog!